If you haven't already, please click here to sign a petition calling for San Francisco State University (SFSU) to end its Memorandum of Understanding (MOU) with An-Najah University in the West Bank. If you've already signed, please share the petition with others. 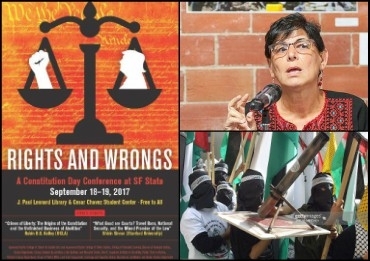 Speaking at a conference on "rights and wrongs," Professor Rabab Abdulhadi complained that "Zionists" are attacking her for brokering SFSU's partnership with An-Najah University, a hotbed of radicalism in the West Bank. In the fevered imagination of the academic left, these are dark days at San Francisco State University (SFSU). Speakers at a two-day conference, "Rights and Wrongs: A Constitution and Citizenship Day Conference at San Francisco State University," described a campus where a "corporatist" administration is at war with its faculty; Arab-American professors are afraid to walk alone on campus; ethnic student organizations are consigned to the dank student center basement; "Zionists" lie in wait to pounce on innocent, beleaguered proponents of "Palestine"; and "white supremacy" rules. All at one of the most radical universities in the nation. 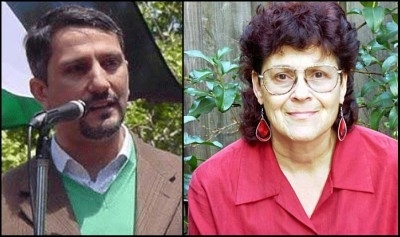 Leading these lamentations was the director of SFSU's Arab and Muslim Ethnicities and Diasporas Initiative (AMED), Rabab Abdulhadi, whose anti-Israel activism is coming back to haunt her. In addition to being named in a Lawfare Project (LP) lawsuit against SFSU alleging "anti-Semitism and overt discrimination against Jewish students," she is at the heart of a Middle East Forum/Campus Watch campaign to end the Memorandum of Understanding (MOU) she brokered between SFSU and An-Najah University, a hotbed of anti-Semitism and radicalism in the West Bank. The conference was held on the top floor of the bustling Cesar Chavez Student Center—adorned by murals of Malcolm X and Edward Said—in spacious, light-filled Jack Adams Hall. A bulletin board near the entrance displayed a flyer calling for the removal of San Francisco's Pioneer Monument, which it dubbed a "monument to white supremacy!" Conference programs featured a graphic of President Donald Trump's silhouette balanced with a white fist on a scale of justice. The audience of mostly students and small clusters of faculty ranged from a sparse fifty to sixty for the panel "Academic Freedom for Whom? Islamophobia, Palestine, and Campus Politics," to around 250—many sitting on the floor after the seats quickly filled up—for "Muslims, Mexicans, and the Politics of Exclusion." 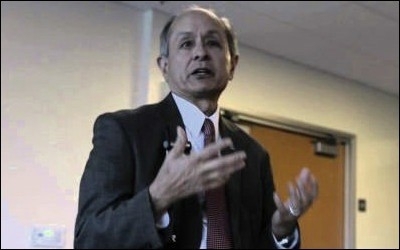 Abdulhadi chaired both panels, while Hatem Bazian, director of UC Berkeley's Islamophobia Research & Documentation Project, participated in the second. Both, she noted, hail from Nablus in the West Bank. The co-panelists were graduate student instructors (one nicknamed "Che"), local leftist activists, and "veterans" of SFSU's 1968 Third World Liberation Front strike. Abdulhadi—who assured the audience she is a woman, lest anyone fear a man heads AMED—was persistently on the defensive. Harried and angry, her rapid-fire speech rendered many words unintelligible. She complained about Campus Watch tweets "attacking her" and marveled at the "four articles" (two pieces, in fact) about the MOU-facilitated "Prisoner, Labor, and Academic Delegation," which sent Americans who served prison time for Weather Underground-affiliated domestic terrorism to meet fellow self-described "political prisoners" at Najah. In Abdulhadi's world, the cultural indoctrination underpinning Palestinian terrorism doesn't exist. She blamed these concerns—and the well-documented history of terrorism and anti-Semitism at Najah—on her opponents' "muddying the waters" with spurious claims of anti-Semitism and falsely conflating Arabs and Muslims with terrorism. In Abdulhadi's world, evidently, Palestinian terrorism and the cultural indoctrination underpinning it simply do not exist. The bulk of her ire, however, was directed at SFSU's administration and her one-time ally, President Leslie Wong, with whom she had collaborated to create the MOU. She noted repeatedly that she had left a superior position as director of the Center for Arab American Studies at the University of Michigan, Dearborn at SFSU's invitation, only to find herself relegated to a "token," subjected to "New McCarthyism," and AMED starved of funds and slated for termination. Abdulhadi says SFSU President Leslie Wong, once her fervent advocate, has bowed to "Zionist pressure." Abdulhadi blamed Wong's supposed abandonment of her on "Zionist pressure," while accusing the administration of "Islamophobia," "anti-Palestinian racism," and the bigotry du jour, "white supremacy." She and her supporters fault Wong for not reacting quickly or stridently enough to the ongoing David Horowitz Freedom Center poster campaign at SFSU, UC Berkeley, and elsewhere, despite evidence to the contrary. As with the grievances she reportedly filed earlier this year against the University "for the hostile and unsafe work and study environment for Palestinians, Muslims and Arabs on campus," there is little proof to back up her assertions. Paranoia may better explain her worries, for she then declared, "I do not walk by myself on campus anymore. I am actually very afraid for my life." Because, you see, "the very people who are intimidating and harassing us, including people who have served in the Israeli military—and I grew up under Israeli occupation—are walking around on campus." Who knew that IDF soldiers are menacing SFSU's faculty?! Abdulhadi's co-panelists, in turn, praised her not only as a "Palestinian scholar" and a founding member of the U.S. Campaign for the Academic and Cultural Boycott of Israel, but as a pillar of the community. Diana Block, a participant in the Prisoner, Labor, and Academic Delegation, solicited funds on Abdulhadi's behalf and encouraged audience members to attend a hearing in San Francisco on November 8 for motions to dismiss and strike the LP lawsuit filed by both Abdulhadi and the California State University system (CSU), of which SFSU is a part. This proves the University is indeed defending her, including deploying her tactic (in CSU's motion to strike) of accusing her opponents of racism against "brown, black, and Muslim people." Yet Abdulhadi is her own worst enemy. After spewing anti-Semitism in a rant written in response to the suit, she again exhibited the very bigotry she denies exists: she railed against the Jewish Community Relations Council (JCRC) for condemning the General Union of Palestinian Students' (for which she serves as faculty advisor) disruption of Jerusalem Mayor Nir Barakat's 2016 SFSU talk. Then, despite the University's conclusion that Jewish student group Hillel was "improperly excluded" from a February campus civil rights information fair, she thundered "People who are . . . oppressors have no place in spaces where people need to be protected. So, the Know Your Rights Fair was right to not have a table for Hillel!" Bazian piled on by repeating his contention that, "Many of those who are engaged in the Islamophobia industry have been engaged in it to protect Israel's interests in the U.S." They believe, he maintained, that "stoking anti-Muslim sentiment and Islamophobia is the way to protect Israel." No longer will activists posing as academics to push an illiberal agenda go unopposed. Conspiracy-mongering co-panelist Sara Kershnar of the International Jewish Anti-Zionist Network (IJAN) claimed an IJAN report to which Abdulhadi and AMED contributed exposed several "Zionist backlash" organizations, including the Middle East Forum, whose president, Daniel Pipes, she dubbed "one of the fathers of the Islamophobia industry" and an "intermediary" for "millions and millions of dollars" that he doles out to his minions. Pipes, Horowitz, LP, the AMCHA Initiative, the Zionist Organization of America, and JCRC are, she warned, "at the center of the attack on SFSU." Abdulhadi and her anti-Israel cohorts may feel besieged, but they're hardly victims. What they label a nefarious plot is simply a justified, lawful reaction to their dominance at SFSU and universities across the nation. The MOU with terror-promoting An-Najah is among the most blatant examples of this overreach and the Middle East Forum remains committed to its demise. No longer will activists posing as academics in order to push an illiberal agenda go unopposed.